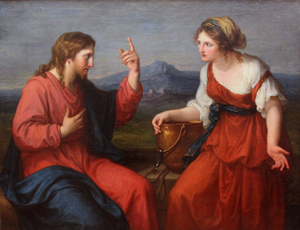 Today’s Gospel is about Jesus and the Samaritan woman at the well. I have always loved this woman’s reaction to her encounter with Christ! Jesus not only breaks societal customs and speaks to her but also talks with her about her divorces—yet she is not afraid or ashamed. We may wonder whether we could do that or whether, standing in front of Jesus, we would feel ashamed of the mistakes we have made in our life. The Samaritan woman gives us an example of someone who has experienced the love of Christ—a love that is not conditional on any circumstances of her or our lives—and then goes to invite others to be part of it. She gives us a model for what we too can do when we encounter Christ today. We are called not to get stuck in our sins or mistakes but instead to come to trust that even after all that has happened, Christ still loves us and is present with us. After we have experienced this presence, we can follow the Samaritan woman’s example of telling others about such a love as Christ’s! Are there experiences in your life that you would rather others, perhaps even God, didn’t know about? How have you experienced Christ’s love for you even in those times? Are there people you know who need to hear this message of unconditional love? How might you share it with them?